Our recent Freakonomics Radio episode “Are Payday Loans Really as Evil as People Say?” explores the arguments for and against payday lending, which offers short-term, high-interest loans, typically marketed to and used by people with low incomes. Payday loans have come under close scrutiny by consumer-advocate groups and politicians, including President Obama, who say these financial products amount to a form of predatory lending that traps borrowers in debt for periods far longer than advertised. The payday loan industry disagrees. It argues that many borrowers without access to more traditional forms of credit depend on payday loans as a financial lifeline, and that the high interest rates that lenders charge in the form of fees — the industry average is around $15 per $100 borrowed — are essential to covering their costs. The Consumer Financial Protection Bureau, or CFPB, is currently drafting new, federal regulations that could require lenders to either A) do more to assess whether borrowers will be able to repay their loans, or B) limit the number of times a borrower can renew a loan — what’s known in the industry as a “rollover” — and offer easier repayment terms. Payday lenders argue these new regulations could put them out of business. Who’s right? To answer questions like these, Freakonomics Radio often turns to academic researchers to provide us with clear-headed, data-driven, unbiased insights into any number of topics, from education and crime to healthcare and sleep. But as we began digging into the academic research on payday loans, we noticed that one institution’s name kept coming up in many papers: the Consumer Credit Research Foundation, or CCRF. Several university researchers either thank CCRF for funding or for providing data on the payday loan industry. Note the words “funded by payday lenders.” This piqued our curiosity. Industry funding for academic research isn’t unique to payday loans, but we wanted to know more. What exactly is CCRF? However, there wasn’t a whole lot more information about who runs CCRF and who exactly its funders are. CCRF’s website didn’t list anyone affiliated with the foundation. The address given is a P.O. Box in Washington, D.C. Tax filings show a total revenue of $190,441 in 2013 and a $269,882 for the previous year. Then, as we continued our reporting, documents were released that shed more light on the subject. A watchdog group in Washington called the Campaign for Accountability, or CfA, had submitted requests in 2015 under the Freedom of Information Act (FOIA) to several state universities with professors who’d either received CCRF funding or who had some contact with CCRF. There were four professors in all, including Jennifer Lewis Priestley at Kennesaw State University in Georgia; Marc Fusaro at Arkansas Tech University; Todd Zywicki at George Mason School of Law (now renamed Antonin Scalia Law School); and Victor Stango at University of California, Davis, who is listed in CCRF’s tax filings as a board member. Those documents show CCRF paid Stango $18,000 in 2013. 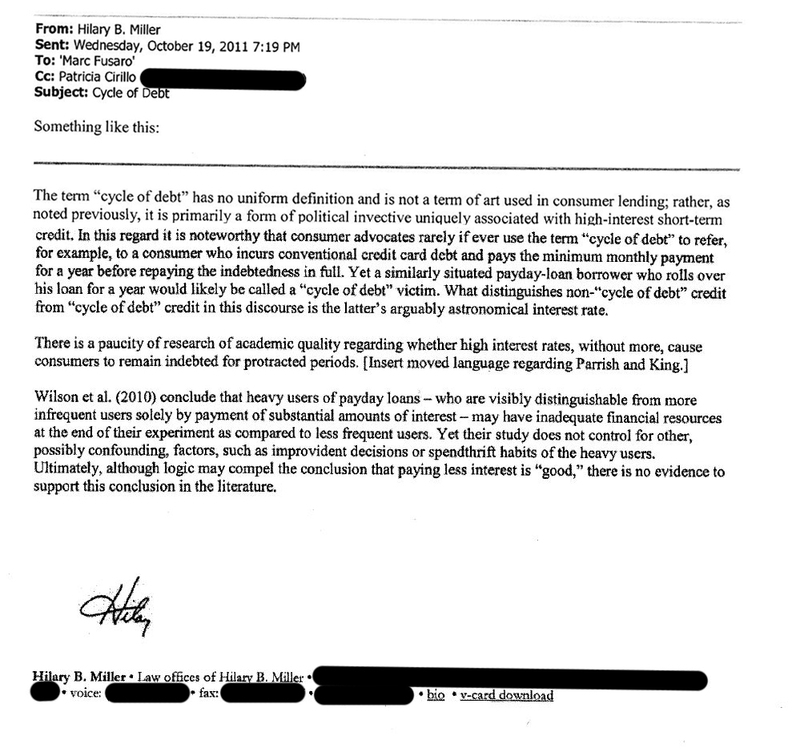 What CfA asked for, specifically, was e-mail correspondence between the professors and anyone associated with CCRF and a number of other organizations and individuals associated with the payday loan industry. So what type of responses did CfA receive from its FOIA requests? George Mason University simply said “No.” It argued that any of Professor Zywicki’s correspondence with CCRF and/or other parties mentioned in the FOIA request were not relevant to university business. University of California, Davis released 13 pages of requested e-mails. They primarily show Stango’s resignation from CCRF’s board in January of 2015. 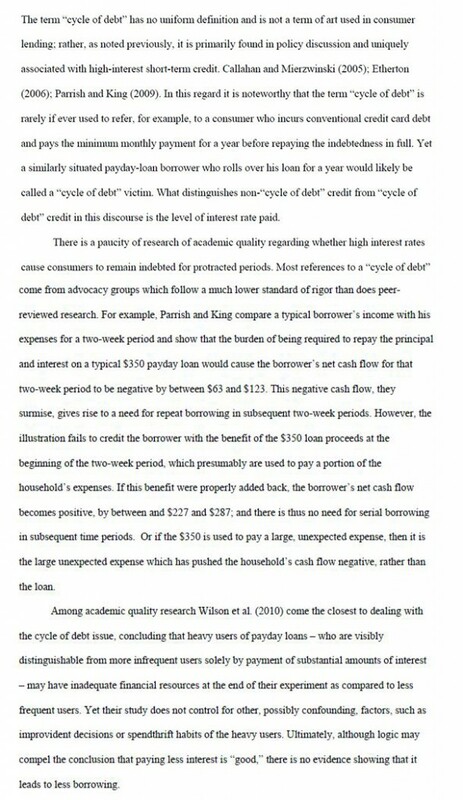 To answer that question, Fusaro and his coauthor, Patricia Cirillo, devised a large randomized-control trial in which one group of borrowers was given a typical high-interest rate payday loan and another group was given a payday loan at no interest, meaning borrowers did not pay a fee for the loan. 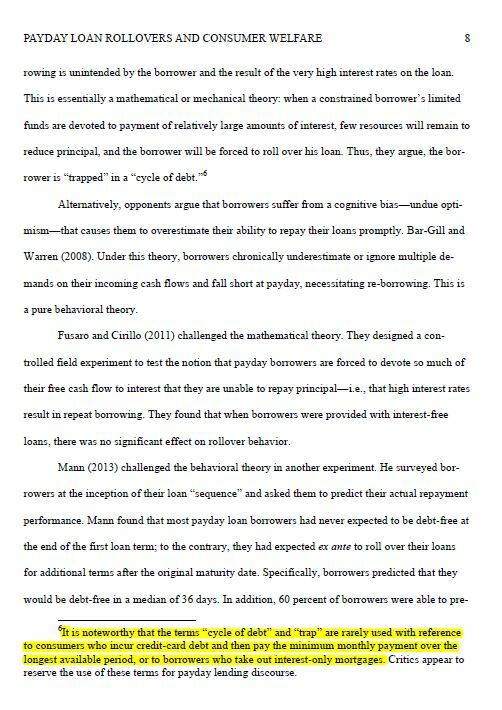 When the researchers compared the two groups they concluded that “high interest rates on payday loans are not the cause of a ‘cycle of debt.’” Both groups were just as likely to roll over their loans. However, in response to the Campaign for Accountability’s FOIA request, Professor Fusaro’s employer, Arkansas Tech University, released numerous e-mails that appear to show that CCRF’s Chairman, a lawyer named Hilary Miller, played a direct editorial role in the paper. 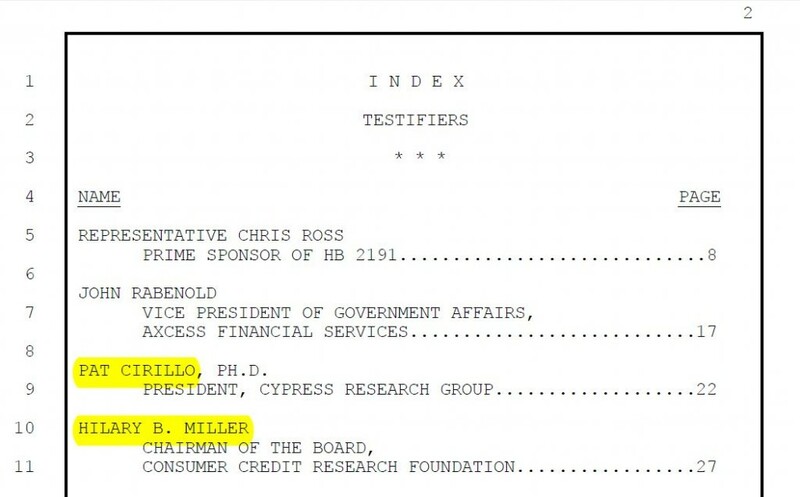 Miller is president of the Payday Loan Bar Association and served as a witness on behalf of the payday loan industry before the Senate Banking Committee in 2006. At the time, Congress was contemplating a 36 percent annualized interest-rate cap on payday loans for military personnel and their families — a measure that ultimately passed and subsequently caused a large number of payday loan storefronts near military bases to close. 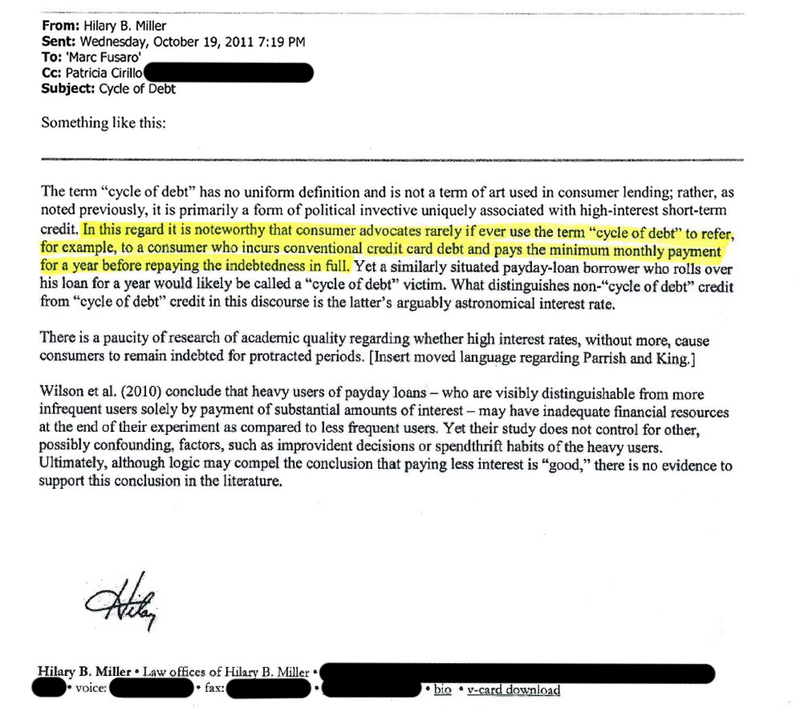 Despite the fact that Fusaro claimed CCRF exercised no editorial control over the paper, the e-mails between Fusaro and Miller show that Miller not only edited and revised early drafts of Fusaro and Cirillo’s paper and suggested sources, but also wrote entire paragraphs that went into the finished paper nearly verbatim. 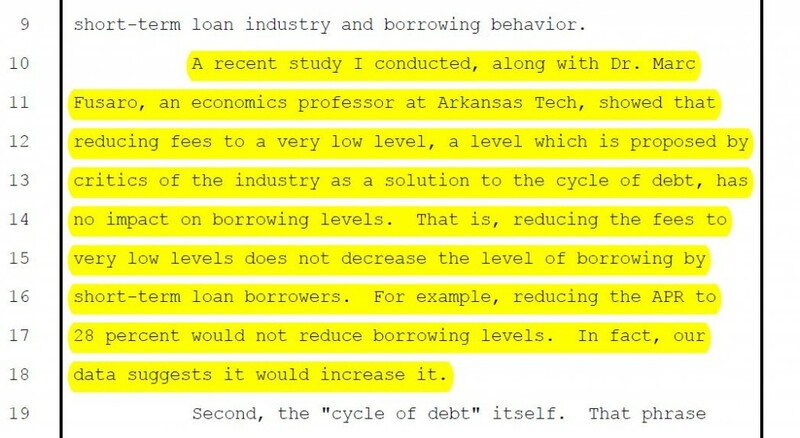 MARC FUSARO: The Consumer Credit Research Foundation and I had an interest in the paper being as clear as possible. And if someone, including Hilary Miller, would take a paragraph that I had written and re-write it in a way that made what I was trying to say more clear, I’m happy for that kind of advice. I have taken papers to the university writing center before and they’ve helped me make my writing more clear. And there’s nothing scandalous about that at all. I mean the results of the paper have never been called into question. Nobody had suggested that I change any other results or anything like that based on any comments from anybody. 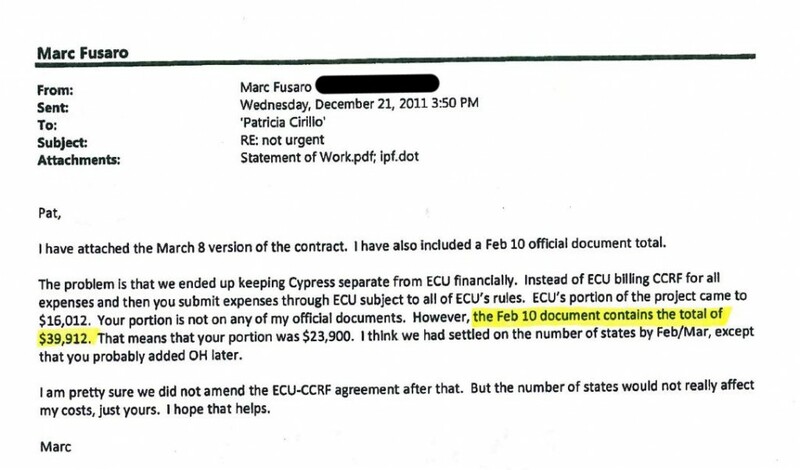 An e-mail from Marc Fusaro dated December 21, 2011, reveals that CCRF paid at least $39,912 for the expenses that he and Cirillo incurred in conducting their research. CCRF’s tax filings show a total revenue of $152,500 that same year. Hilary Miller, CCRF’s chairman, declined to speak with us on the record. RONALD MANN: If your prior is that none of the people using this product would do it if they actually understood what was going on – well, that just doesn’t seem to be right because the data at least suggests that. Most people do have a fairly good understanding of what’s going to happen to them. ROBERT DEYOUNG: Had I written that paper, and had I known 100 percent of the facts about where the data came from and who paid for it — yeah, I would have disclosed that. I don’t think it matters one way or the other what the research found and what the paper says. We reached out to Professor Priestley and Kennesaw State University for comment. Neither were available to respond in time for publication. It is well-established that industries sometimes fund research that might be in their interest, be it sugary-beverage companies that pay for obesity studies or petroleum companies that pay for climate-change research. We also know that researchers often depend on industries for data. But right at this moment, the CFPB is drafting new consumer protections around payday loans. Payday lenders argue that those new regulations could shut down an industry used by ten to twelve million consumers. So, depending on your point of view, the terms and conditions of payday loans are either about to get a lot fairer for borrowers, or those who depend on payday loans are about to lose access to an indispensable form of credit. In the midst of that debate, it’s essential to know when an industry funder is writing the checks, and perhaps more important, when it also plays a role in writing the actual research. « Previous PostShould Tipping Be Banned?